Open the Package: Let's Play! 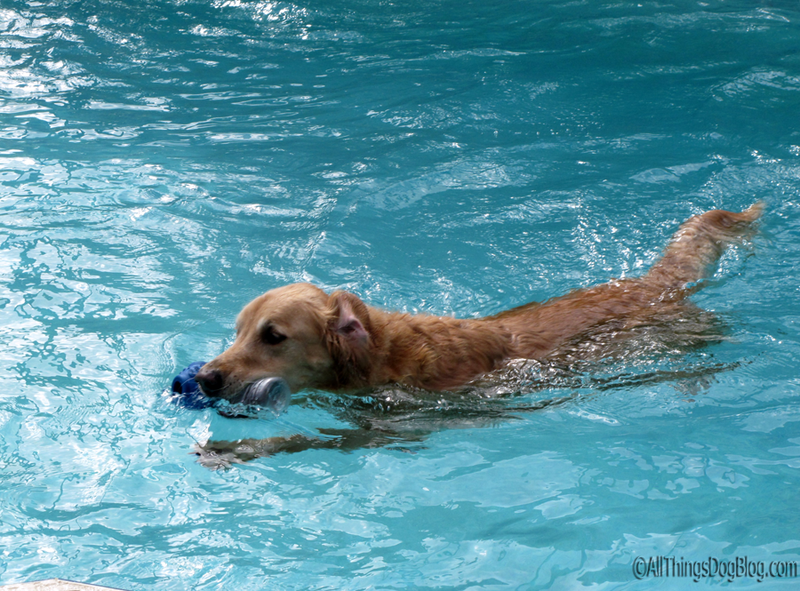 Once Tanner hit the pool, the toy got a real workout with lots of crunching and crackling. I later added 2 more water bottles (any size will do, so feel free to use 2 Liter bottles for your Dane or Mastiff) to increase the fun. Today, after shooting the photos you see here, he is busy dragging it around the house, crunching and muching on the bottles--such fun! The base unit is heavy and solid enough to deter power chewers, but I would advise changing out the bottles when they get flattened. Better to be safe and avoid broken pieces of plastic lying around, especially if you have kids or other pets. The Bottle Buddy tosses really well, even for a challenged thrower like myself. And flinging it like a Frisbee disk is fun too. Use your creativity to have some playtime with your dog indoors, outdoors, and at the park where you can hurl it a good long way. 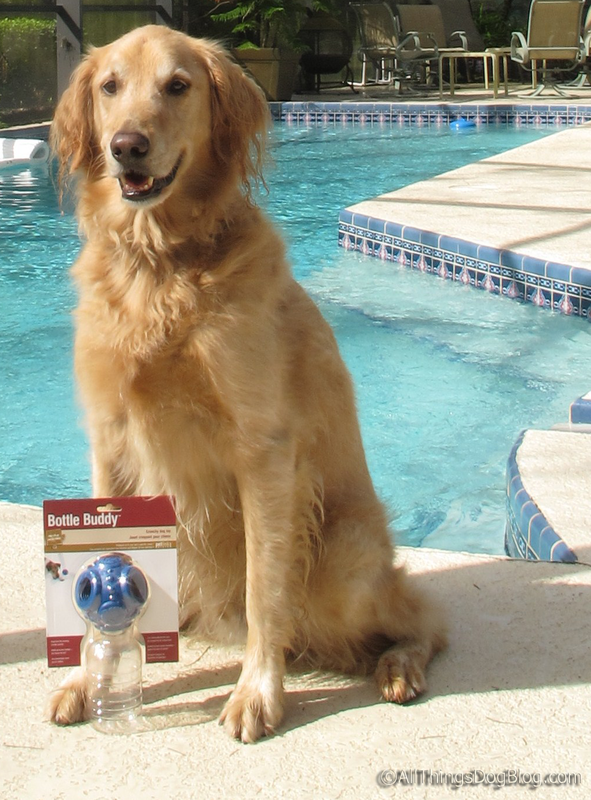 Want to learn more about Petlinks and their toys? Check them out on their website and Facebook. You'll find some other videos of their new products on the website, and feel free to get into the conversation on their Facebook page. Be sure to tell them that Tanner sent you! One of the greenest features of this toy that we really love is that it uses what is practically an unlimited resource in today's society--empty plastic beverage bottles. Also, the Bottle Buddy doesn't take up much space in our RV. We can add water bottles when ready to play, but until then, it tucks nicely into the dog drawer where all Tanner and Oliver's things are stored. Space saving items are really a treasure for us, so this toy will get a lot of action when we visit beaches and dog parks as we travel. Better yet, the crunchy noise is great entertainment when Tanner is just hanging around the campground. What a great toy! 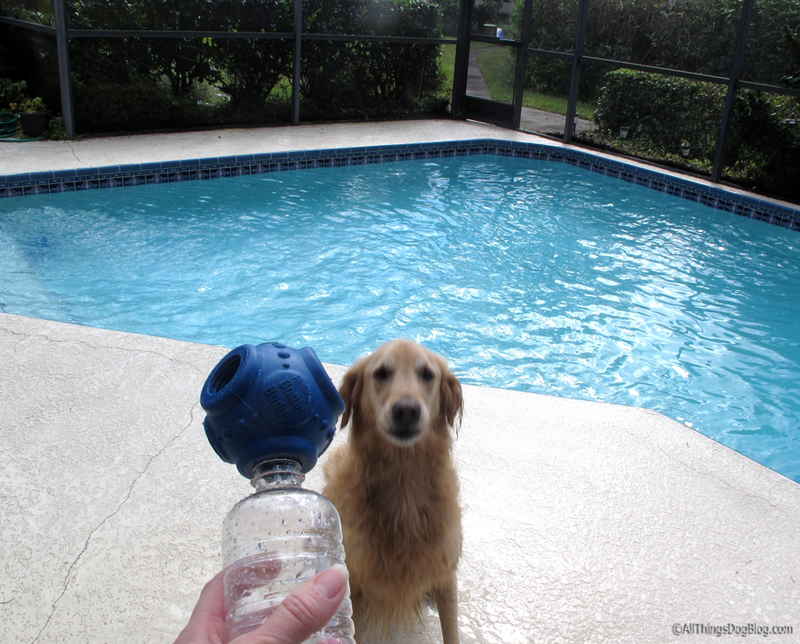 Petlinks is the company that brought you the Scents of Security toy we reviewed at this link. My boys still love this toy, and we're sure you will too. You'll find a list of retailers at the PetlinksSystem website. All Things Dog Blog was not paid to review this toy. The toy was provided to us at no charge, but we did agree to offer our honest opinion; we love it!